Why not get an awning that can be adjusted to meet your needs so that no matter what you need to do during the day, you can get the job done with ease as well as have an elegant addition to the exterior of your home? 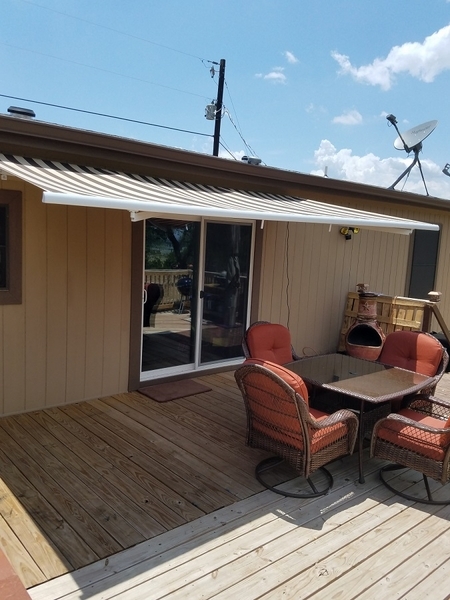 With the Maui Motorized Retractable Awning with a Remote by Awntech, you have an item that can be adjusted to whatever you need by simply touching and using the remote control. How many wall brackets are provided with a 14 ft canopy? There are 3 mounting brackets included with the 14' awning. For more details, feel free to reference page 3 of the User Manual here, which you can also view anytime by clicking the link beneath the main picture on the product page. Are the sufit brackets included? Soffitt brackets are not included. Per the instruction manual, you will need three. What type of power supply is required to operate the motor on this Awning? This requires just a standard outlet. What is the weight of the 14'x10' retractable awning? Per the manufacturer, this unit weighs in at 130 pounds. What about when it is raining? Is it waterproof? This awning is not water-proof but it has been treated with Teflon to make the fabric water repellent. Can this be attached to an rv motorhome? These are recommended for homes and business only. How well will the fabric hold in high altitude sunny areas where sun fades and breaks down fabric? What's the maximum wind speed for the open retractable awning? 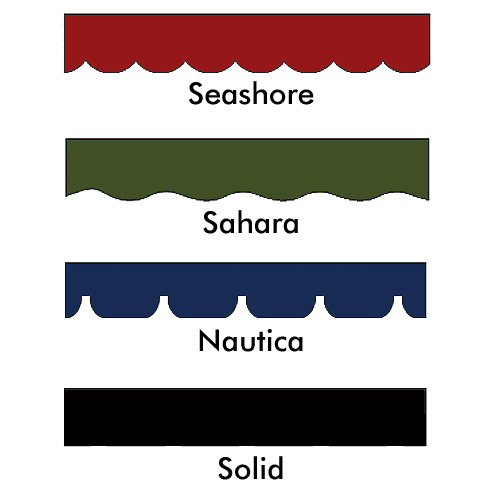 The awning fabric has a UV/fade rating of 5 years. 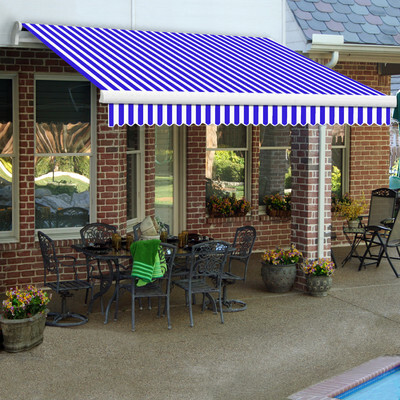 It does not have a wind rating and the manufacturer recommends the awning always be retracted in high winds. How does it stay standing out? Where are the posts? It has arms built in under the awning fabric to hold it up. They are designed to support the canopy weight per the width and projection on the awning you choose. I want to cover a deck beside a camper. It would mount to posts and a 2' x 12' treated board. I need 24 ft at the back where it mounts and 12 ft projected outward. Could I use anchor poles to give it more support at the farthest corners of the awning? These canopies extend 122", which is 10 ft 2 inches. Also, that sort of installation would invalidate the warranty, as it would need to be installed according to the manufacturer's directions for the warranty to apply. Can the 8 ft wide awning extend out to 10 feet? What are the wind limitations of the awning? AN 8 ft wide awning will only extend to 7 feet. You would have to go with the 12 ft wide awning to reach the 10 ft projection. The wind limitation is 30 MPH. On the 10' model is the fabric 10'? What is the out to out of the 10' model? If you order a 10' foot awning the fabric will be 10'. Can this awning be stopped half way out? This awning can be stopped at any point upwards to its final projection. The awning is of good quality, and easy to install. We bought the awning to shade our slider leading out to our deck in the morning hours, reducing the morning sun from heating up our dining room. It also comes in handy when grilling out and a sudden rain pops up. ProsGood quality at a reasonable price. ConsI'm going to try to attach some sort of support to the front of the awning to keep it from parachuting when a burst of wind flares up. My canopy is wonderful, only, why aren't install brackets included or made available? ProsThis keeps the patio shaded nicely: impressive. Cons...No install brackets or accessories (winter cover).